The big idea behind the “Toy Story” movies is that toys come to life and have a community of their own once the humans are out of the room. So what happens when one of the humans dresses up like one of the toys? Being a living toy who can’t let on that you’re alive even as you’re being played with by a living kid dressed up exactly like you has to be something of a mind-blowing situation. But now we’re getting into weird areas of science-fiction, and that’s hardly what “Toy Story” is all about. 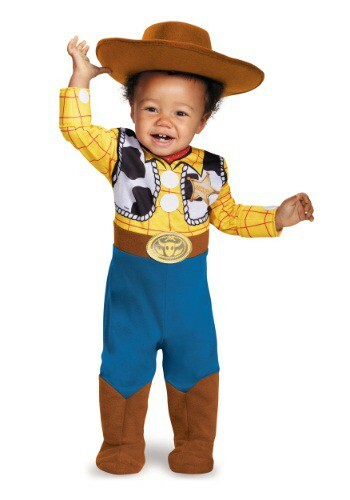 Given what we know about Sheriff Woody, he’d probably just be flattered that a kid wants to dress like him. He’s a good-natured guy who puts a kid’s happiness above all else. It has to be a strange experience watching a three-foot tall version of yourself yelping your catchphrases like, “There’s a snake in my boot!” but like they always say, imitation is the sincerest form of flattery. When your little ones feel like flattering their favorite playmate, you can’t beat this officially licensed polyester jumpsuit with attached faux boots and belt with buckle. It’s got all of Woody’s signature style, up to and including the all-important cowboy hat. Since this is a genuine kid and not a life-size toy we’re dealing with here, you’ll appreciate the inner-leg snaps for easy diaper access. It’s a perfect recipe for fun for any toy-loving kid, and we have a feeling the toys themselves will feel the same way.